The awesome brush gods from the game Okami!! In Ōkami, there are thirteen gods who represent the twelve members of the Chinese Zodiac plus the cat, who is included in the Zodiac legend but is not normally an actual member. Amaterasu possessed all thirteen brushstrokes in her Shiranui form, but at her death, each brush split off and went its own way to wait for her return. It is unknown if each brush god possessed a form before then. In order to regain her powers, Amaterasu must seek out these gods to restore the balance of nature to the world of Nippon. 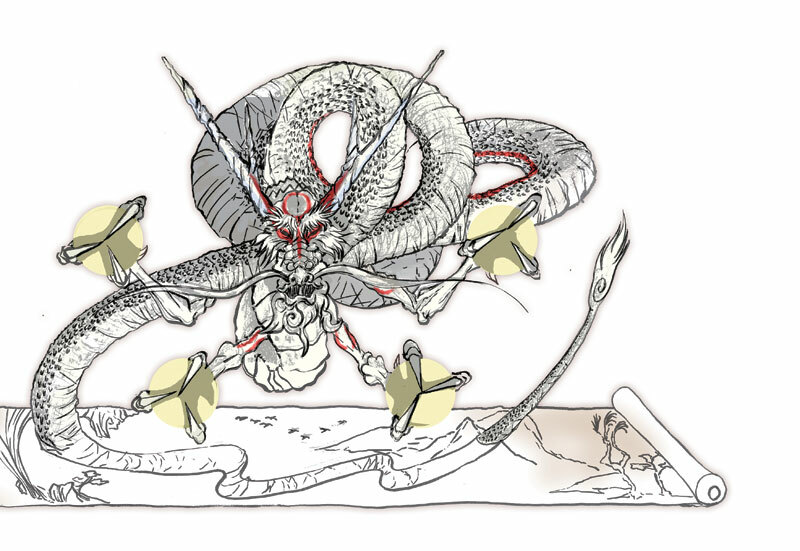 The following list presents those thirteen brush gods in approximately the same order in which Amaterasu encounters them, although the three Hanagami are encountered at separate times and it is possible to meet Bakugami before any of them. The bottom of the save menu displays small statue-like icons of the brush gods that correspond to the brush techniques she possesses at each save point; these icons are sorted in the traditional zodiac order, beginning with the mouse and with the cat tacked on at the end. Divine Instrament: He carries four yellow orbs in his claws, though their purpose is unknown. Other:Yomigami is a huge dragon with a scroll attached to his tail. He represents the dragon in the Chinese Zodiac.